Mathematics is finally getting its fair share of the museum world. 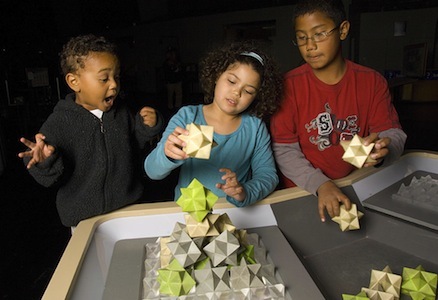 Hot on the heels of the launch of MoMath, Glen Whitney's Museum of Mathematics, and the Swedish Mathematics Palace I discussed in my September, 2009 column, San Francisco's excellent Exploratorium recently launched its Geometry Playground. All of the photos in this month's column are from the exhibit. They were taken by Amy Snyder and are copyrighted by the Exploratorium, which kindly provided them to me for display here. 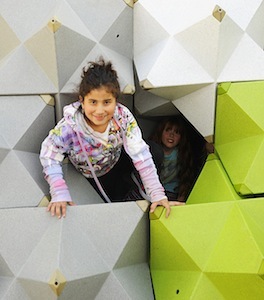 The focus of the Geometry Playground is shape, with different exhibits letting the visitor explore shapes as we see things, shapes that surround us, how shapes can fit together, and shapes as they relate to motion. Such exhibits are always fun to visit, and for those of us in mathematics education it is interesting to watch others reactions to what they see and experience, particularly young children and families. Math exhibits probably help raise awareness of mathematics concepts - in some cases by making people realize that certain things actually are mathematical concepts! But do they help students become better able to do math? The jury is largely still out on that, but the Geometry Playground is the setting for an ongoing research project being carried out by the Exploratorium to study how people approach the challenges presented by the various mathematical exhibits. Hidden away from the gaze of the museum's visitors, a team of researchers is pouring through hours of video recordings captured by overhead cameras in the museum. 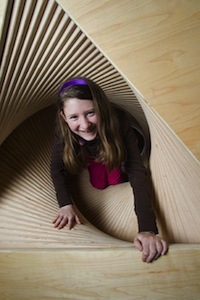 Certainly, exhibit designer Tom Rockwell, who led the design and construction of the Geometry Playground, and who took me on a tour of the exhibit recently, thinks there could be a positive classroom effect, but he will be satisfied if children, adults, and families simply have a fun few hours exploring a world of shapes. And that they are definitely doing, as I witnessed with my own eyes. Gyroid. A curved surface that divides space into two complementary, connected regions. The challenge is to fit these stellated rhombic dodecahedrons together to fill space without leaving any gaps. Crawl through this curved tunnel made up of straight rods connected into equilateral triangles of the same size. 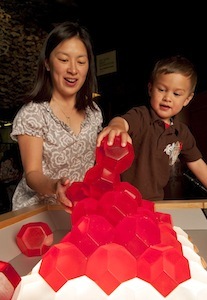 Crawl through a large version of the tessellation you created in the exhibit shown in photo 2. 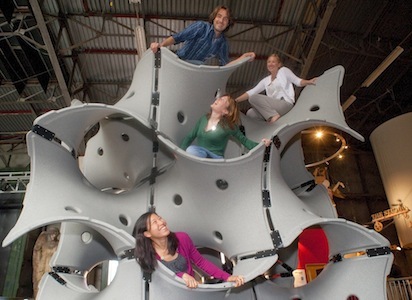 Do it with your friends in a climbing version with hand- and foot-holds. 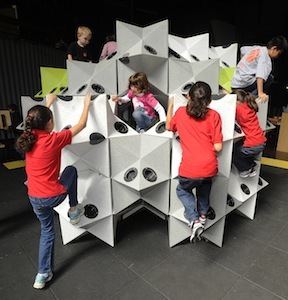 Can you build a pyramid with these 14-sided truncated octahedrons? The Geometry Playground remains at the Exploratorium (Palace of Fine Arts, 3601 Lyon Street, San Francisco, CA 94123) until September 6, 2010, then moves to the Science Museum of Minnesota, St. Paul, Minnesota for Fall 2010 through Winter 2011, then travels back west to the Reuben H. Fleet Science Center in San Diego, California for Summer 2011 through Spring 2012. Devlin's Angle is updated at the beginning of each month. Find more columns here. Follow Keith Devlin on Twitter at @nprmathguy. Mathematician Keith Devlin (email: devlin@stanford.edu) is the Executive Director of the Human-Sciences and Technologies Advanced Research Institute (H-STAR) at Stanford University and The Math Guy on NPR's Weekend Edition. His most recent book for a general reader is The Unfinished Game: Pascal, Fermat, and the Seventeenth-Century Letter that Made the World Modern, published by Basic Books.